So I work in a primary school, as a TA, and a teacher has asked me to give a presentation to the class, because we're studying Buddhism in RE and she knows I'm a Buddhist. I've attached my presentation as it is so far, for you lovely folks to read and suggest anything I might include, change, or remove. I've done my best to simplify the fundamentals of Buddhism for 8-year-old minds. FYI, they've already learned about the Buddha's life, the Four Noble Truths, and the Noble Eightfold Path. Have you come across any good resources for kids? I'd love to show a YouTube video, for example, but I haven't found one that's quite right. I wasn't able to open your attachment, but I first got turned on to Buddhism at that age. I was enchanted by the logic of it! The 4 Noble Truths and the Eightfold Path were enough to intrigue me, to the point that I started doing my own reading at the neighborhood bookstore. If the kids ask if the Buddha is a god, or if there is a god in Buddhism, you could explain simply, that Buddhism is a roadmap to solve your own problems and to be a better person. It's about kindness. Would love to read your presentation, though. Same as @Dakini with opening it. Could you post it directly on the forum? I'd be interested in seeing it. If the kids ask if the Buddha is a god, or if there is a god in Buddhism, you could explain simply, that Buddhism is a roadmap to solve your own problems and to be a better person. It's about kindness. I’ll try and change the format and re-upload it. I'm a little underwhelmed with it, to be honest. I'm going to lead (briefly) the two meditations I've described, and I'll ask what the kids think. I’m aware that I’ve vastly simplified and poorly represented the different schools of Buddhism around the world. I just wanted to explain that there are different flavours of the religion, and to suggest some things that might be emphasized by them. I’m also aware that I’ve oversimplified the loving-kindness meditation, but I don’t want to overload them with information. They are just 8. Anyway, here it is again. Let me know if you still can't open it. I managed to download the file and open it. Thank you Google Chrome...? Yes, I would quote the Dalai lama on two counts: One, that he states his religion is kindness, and two, "Be kind whenever possible. It is always possible". One of the most precious things children can learn, is to be kind to one another. 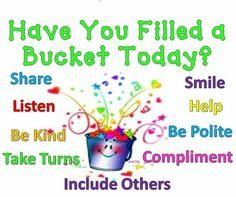 Ask them in what ways they think they can be kind? 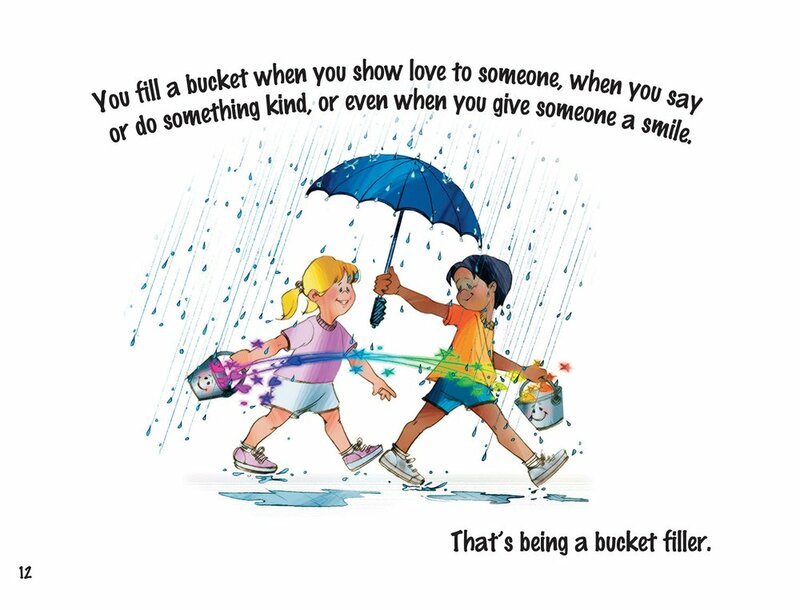 My grandson got a book for christmas, about being kind, and filling someone's bucket. Maybe you could incorporate/end with something along these lines. No problems viewing the pdf. I thought it was a good presentation, colourful and informative. I didn’t see any mention of the 4NT or 8FP but I don’t think it is necessary. For 8 year olds the focus on kindness is probably just as good. If you search on YouTube for “Thich Nhat Hanh kids questions” you’ll come across a page full of videos where he answers various questions from children, about anger, sleep and other things. Perhaps one of them will suit your vid needs? I think you’re right, plus they’ve already had the basics on the 8FP and the Buddha’s life. And too many lists do not appeal to Year 4s. I have done this actually! I was unsure whether to use one, because there’ll be a lot of unfamiliar terms like “dharma”, “sangha”, and so on. But maybe these terms wouldn’t bother them, and they’ll still get the gist. I’m not sure. @Shoshin, thank you! I’ll watch the video you posted. Jakata tales may also be interesting to them. As you are presenting to 8 year olds and you clearly have a limited time, it is a good overview. It is a start. It is enough for a quick overview. In fact, there are practitioners of Buddhism in almost every country. Traditionally, Thervadic Buddhism is predominant in South East Asia. Tantric is predominant in Tibet and Nepal, Mahayana predominated in China, Korea and Japan. Buddhism is a growing religion. The largest ley organization has over 12 million practicing members worldwide, is growing and does not have or follow a priesthood. This is just extra data, of course. Your presentation, as proposed, should be well received. One point: you don't say this, but on one of the first slides, you say that Buddhism went to China, then "from" China to Tibet. This implies that China evangelised Tibet, indirectly. Tibet was actually evangelised by Indian Buddhists, hence the late Indic Vajrayāna, not Chinese Mahāyāna, that Tibet inherited. Vajrayāna was in a late stage of syncretic Indian religion when it entered into Tibet, as opposed to syncretic Chinese Buddhism. There was actually a sort of ecumenical council in Tibet, where they decided to go with Buddhism from India rather than China, but I can't remember which one. Interesting details, @Vimalajāti, thanks. I didn’t want to over-complicate the presentation, but I also didn’t mean to imply that Chinese Buddhism went to Tibet. I was just trying to outline the timeline of the different traditions. The presentation went pretty well in the end. They listened well and mostly seemed to try the meditations with genuine interest. I don’t think meditation is so exotic as it used to be in the UK. They were reasonably familiar with the idea, though not the specifics. Then they asked some interesting questions: Is there a God in Buddhism? Do Buddhists eat different food? Do they have a celebration like Christmas? Is it fun being a Buddhist? How do you become one? I tried to answer these as fully as possible without being confusing, and I think the whole thing was generally enjoyed. One boy told me afterwards, “I want to be a Buddhist.” I was careful not to show it, but I was secretly very happy. Moody Cow Meditates was a regular favorite of my children were they were young. There is an easy DIY craft (mind jar) that demonstrates "thoughts" and mindfulness in the book also. @Vastmind, I’ll have a look, thanks!